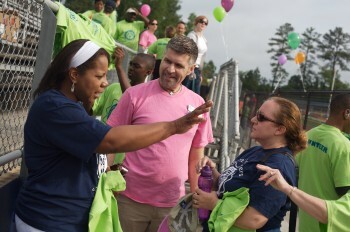 Parent mentors partner with parents to support them in becoming more engaged in their children’s educational programs. They share information, encourage participation in IEP meetings, and help identify needed resources and services. In schools, parent mentors partner with teachers, administrators, and other school staff to integrate family engagement into school and district activities. They provide information about the needs of students and their families, they collaborate with teachers to implement reading and math initiatives, and they work with teams focusing on reducing dropout and increasing graduation rate. Mentors also partner with over 700 Title I Parent Involvement Coordinators to align their work with district family engagement activities for at-risk students. Parent mentors also work with community partners to increase vocational training and job opportunities as well as recreational options for students. Parent mentors also collaborate with personnel from a variety of agencies to support families of students with disabilities. They work with staff from Parent to Parent (P2P) of Georgia, the state’s Parent Training and Information Center, to make information available on a large number of topics in a variety of formats including the project’s website at http://www.p2pga.org/. The Georgia Parent Mentor Partnership, is a founding member of the Georgia Parent Leadership Coalition (PLC) a collaborative effort between organizations representing families of children and adults with disabilities in Georgia. The Coalition is focused on building, supporting and strengthening parent leaders across the state. The Southeastern Postsecondary Education Alliance recently hosted a conference in Atlanta. Thanks to the photography of Ryan Johnson and leadership of Susanna Miller-Raines, from the Center for Leadership in Disability at Georgia State University, we can share a peek at the event. Scroll down to the SEPSEA2016 document.